In the choice between DREAMers and positioning herself for a GOP primary, Coffman chose the primary. Gov. 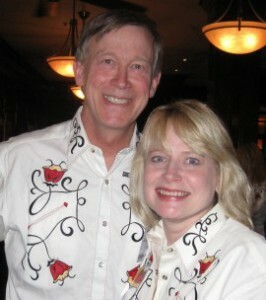 John Hickenlooper and AG Cynthia Coffman. Colorado announced Wednesday that it plans to join more than a dozen other states in a lawsuit challenging President Donald Trump’s decision to end the Deferred Action for Childhood Arrivals program, which protects young immigrants living in the U.S. illegally from deportation. An outside attorney will act as a special attorney general and represent Colorado in the legal action, she said. The move requires Coffman’s consent because she is the only one who can file legal challenges on behalf of the state. So-called “DREAMer” students and young people, who are the most sympathy-inspiring class of undocumented immigrants being childhood arrivals in this country who in many cases know no other culture, are supported by a large majority of the public–either for a path to American citizenship, or at the very least legal permission to remain in the country. There are really not many people in America outright opposed to protecting DACA recipients in some form–but unfortunately for Cynthia Coffman, who is trying to figure out a path to the GOP nomination for governor of Colorado next year, a lot of those opponents are GOP primary voters. And that, dear reader, is why Coffman is reluctant to go to bat for the DREAMers. So what you're saying is, Cynthia Coffman is being smart politically and positioning herself well for the primary? Yup Moldy. Thats what happens when you have to appeal to an insane death cult in order to win a primary. Much like Governor Maes . . .
You're cheering her on for the nomination? What gives? I thought you were George Broccoli supporter. She's being a chickenshit, Moddy, and stupid. Which is pretty much how she's been as AG. A vacuous waste of space. Really? Where her courageous ex-husband came out in favor of legislation to protect these kids before he came out against it. Fluffy, let's face it. Your party is not going to be able to finesse this issue. No wall, more border security and the DACA kids get to stay. Do we need to maintain a suicide watch on Moderatus? No, but we may need to repot him! Check with Cookie. And that has to be the most hideous shirt ever. Democrats and Republicans alike should have refused to put it on, in a spirit of bipartisanship. Wasn’t it required wear at some AFP BBQ?